The new year is here, and now is the perfect time to wipe the slate clean and start 2019 off on the right foot. While many people’s New Year’s resolutions will be centered around eating healthier and exercising more, here at Emsisoft we’re more concerned about your digital wellbeing. Cybersecurity promises to remain an important topic in the year ahead as more internet-connected devices enter the home, attackers increasingly leverage the power of AI and consumers come to rely even more on cloud-based services. But all is not lost! Regardless of what 2019 brings, good basic cyber hygiene is still the best defense for protecting yourself against modern digital threats. We’ve rounded up 10 simple Internet security tips to make 2019 your most cyber secure year ever. A good backup strategy offers the ultimate peace of mind. In the event of data loss – due to, say, ransomware or hardware failure – you can simply restore your system to its original safe state. Keeping 3 copies of your data. Storing 1 copy offsite (e.g. using a cloud-based backup service). Maintaining an offsite copy is critical for ensuring your backup is safe even in the event of theft or a natural disaster. Implementing a good backup strategy does require a bit of planning (and probably a small amount of money) but the investment is absolutely worth it. Sleep easy in 2019 knowing that your files will be safe from harm even if your system falls. Hundreds of thousands of malware samples are produced every single day – a trend that’s unlikely to stop any time soon. The most effective way to protect your system against worms, trojans, ransomware, potentially unwanted programs (PUPs) and other malicious software is to invest in a reliable antivirus solution. If you’re a frequent traveler, regularly on the road for work or generally concerned about your privacy, you might want to think about getting a subscription for a VPN service. What does a VPN actually do? Well, when you browse the Internet, there’s a transfer of information taking place back and forth between your computer and the websites you access. However, this information can potentially be intercepted, allowing attackers to steal sensitive information such as your passwords, emails and login credentials. A VPN creates a secure, encrypted connection between your computer and any websites your visit. This makes it much more difficult to identify your system as a source of data, and it also means that any information that is intercepted is encrypted and more or less useless to the bad guys. Two-factor authentication (or 2FA for short) adds an extra layer of security that is used to ensure that people trying to log in to a website or service are really who they say they are. Enabling 2FA means that, in addition to entering your username and password when accessing an account, you’ll also need to provide another piece of information that proves your identity. For example, many banks will issue tokens that generate a one-time use password or send you a verification code to your mobile phone. Most banks, email providers, online stores and other major service providers will offer an option for 2FA, so be sure to enable it wherever possible. It only takes a few extra seconds to log in using 2FA, but it can single-handedly thwart cybercriminals from getting access to your personal accounts (although it should be noted that 2FA is not a perfect solution). It reduces the risk of malware spreading. If your guest connects to your primary WiFi using a device that is – unbeknownst to them – infected with malware, there’s a chance that the malware could spread to other devices on your home network and wreak havoc. Setting up a guest WiFi network can help contain the spread of malware and protect the devices connected to the home network. It limits what information your guests can see. It’s nice to be able to give your guests Internet access, but that doesn’t necessarily you want them to be able to see personal documents or family photo albums that are stored on your home network. A guest WiFi network allows visitors to connect to the Internet without infringing on your privacy. You can set up a guest WiFi network in the settings of your router, which can usually be accessed at 192.168.1.1 or 192.168.0.1 (but not always). Once you’ve logged in as an administrator, look for guest WiFi network settings under “Guest Zone” or “Guest Access” (or similar), and follow the setup instructions. Please note that not all routers have guest network capabilities. From smart locks to theatre systems, gaming consoles to intelligent lighting, the modern home is a wonderland of Internet-connected devices. Otherwise known as the Internet of Things (IoT), these devices are ushering in a new era of convenience and advanced functionality, but they also pose a cybersecurity risk. Using strong, unique passwords for device accounts. Disabling unnecessary features, particularly those that may affect your privacy and/or network security. Always installing the latest software and firmware to ensure your devices are as stable and secure as possible. The average Internet user is expected to have more than 200 online accounts by 2020. Manually keeping track of so many login credentials is next to impossible, which explains why passwords such as “123456”, “password” and “qwerty” remain – much to the delight of cybercriminals – so popular. Using brute force or social engineering tactics, hackers can easily break into accounts guarded by weak passwords and steal whatever information lies beyond. The good news is you don’t have to choose between convenience and a strong password. Password managers enable you to create and store highly secure passwords on the fly, and easily enter them when prompted. There are a few great password managers on the market, including RoboForm, which provides excellent encryption, multi-platform support and an excellent customizable password generator. It’s all too easy to lose a flash drive or external hard drive, particularly if you’re a student or regularly travel for work. In the unfortunate event that your external drive is lost or stolen, you need to be certain that the data it contains cannot be accessed by whoever’s hands it falls into. Hardware: A number of manufacturers make secure flash drives that come equipped with a physical pin pad or fingerprint scanner, which prevent access to the contents of the drive without the correct input. As you might imagine, these secure drives are significantly more expensive than regular external drives. Software: You can also use software to encrypt your external drives, making your files inaccessible to anyone without the password. Pro, Enterprise, and Education editions of Windows 10 come with built-in drive encryption software called BitLocker. Alternatively, you may wish to use VeraCrypt, a free, open-source encryption tool. Almost 1 in 3 people (31 percent) in the United States use an ad blocker, according to a report from Deloitte – and it’s easy to see why. By filtering out HTML elements that contain advertising, ad blockers can protect you against PUPs and malvertising, stop cookies that track your browsing and speed up your web browsing. There are a few different options available for each web browser, but one good option is uBlock Origin; a free, open-source ad blocker that works with most major browsers. Social media platforms have become a hotbed for cybercrime in recent years thanks to the sheer number of users they attract, how easy it is to create fraudulent accounts and how quickly malicious content can be distributed. Make it your goal in 2019 to be more mindful on social media. Think before you click on any links that appear in your feed or personal messages (even if you know and trust the sender), be selective with friend requests (no matter how attractive they look in their profile picture) and don’t share your phone number, address, place of work or any other personal information that could make it easier for someone to steal your identity. We don’t know what the rest of the year has in store for you, but one thing is certain: malware isn’t going away any time soon. 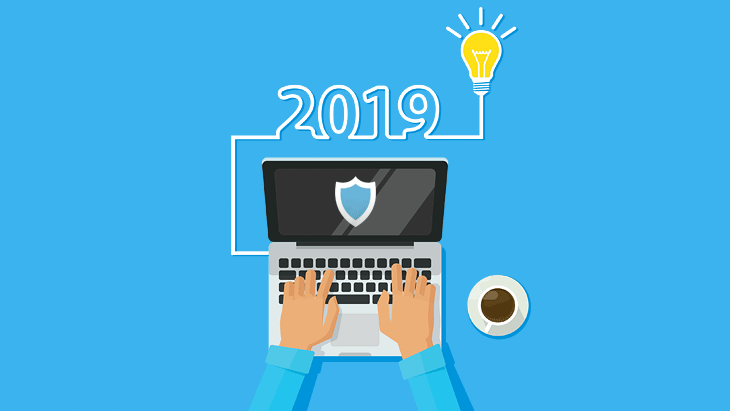 By practicing the security tips discussed in this article you’ll be in a great position to make 2019 your most cyber-secure year ever. Looking for more privacy resources? Head on over to this computer privacy software list! What changes are you going to make to your cybersecurity habits in 2019? Let us know in the comment section below. Have a wonderful (malware-free) day! Starting 1 October 2017, Emsisoft Internet Security will be merged with Emsisoft Anti-Malware.